​Pastor Hughes is a North Dakota native. He was saved as an 18 year old teenager at Bible Baptist Church in East Grand Forks, Minnesota. He has been at East Mesa Baptist Church since May of 1992, having attended Pillsbury Baptist Bible College, International Baptist Bible College, and Pacific Coast Baptist Bible College. Pastor Hughes holds an A.A. in Bible and Missions and a B.A. in Pastorology and a M.A. Degree and in 2005 he received his earned Dr. of Ministry degree from Baptist College of America. He preaches biblical, practical, humorous, and evangelistic messages each week. He enjoys sharing the Gospel with folks that have never heard and seeing them trust Christ as Savior. Pastor Hughes has served for 5 yrs on the board of directors of Pacific Coast Baptist Bible College and 1 year on the board of Heartland Baptist Bible College. He has trained a number of young men through internship. Pastor Hughes is married to Mary, his wife of 36 years. They have two children. Sarah, a graduate of West Coast Baptist College, is married to Pastor Chris Armer. Their son, Joel, is a graduate of Bob Jones University and is serving in the USAF as an internal medicine doctor. Pastor Hughes and Mary have three granddaughters, Grace, Leah and Jana and one grandson, Calvin. He is affectionately known as "Grandpa Marshmellow" by his four grandchildren whom he and Mary dearly love. Pastor Hughes has been Senior Pastor at EMBC since March of 1994. He has led the church through a debt free building program in 2001. ​He loves seeing folks saved and serving the Lord in the local church. Through the church’s Intern Ministry program Pastor Hughes has had the unique opportunity to train many young couples for ministry who are presently serving the Lord in various locations in Arizona and around the country. He is available to help anyone that has a spiritual need or counseling. Please do not hesitate to call him and let him know you are interested in EMBC he will gladly talk to you. ​Dr. Paige served as an assistant pastor, youth pastor, and senior pastor for over 25 years in Massachusetts, Illinois, and Minnesota. He has held a variety of leadership roles in his 53 years of ministry including serving as the president of the Minnesota Baptist Association, Chairman of the Board of Trustees of Pillsbury Baptist Bible College in Minnesota, and President of the Independent Baptist Churches for Biblical Evangelism. He was active in the beginning of the New Testament Association of Independent Baptist Churches and served as the National Representative of that association for nine years. He served as the Executive Secretary of the Minnesota Baptist Association for 18 years before becoming the NTAIBC National Representative. Schools he attended include Moody Bible Institute, Gordon College of Theology, Northern Illinois University and Trinity Theological Seminary. Dr. Paige holds a Master of Divinity and Doctor of Ministry degrees from Trinity Theological Seminary of Newburgh, IN. Dr. Paige has resided in Mesa, AZ since 2003. He and his wife, Ruth, were married in 1959. They have four children, twelve grandchildren, and two great-grandchildren. All four children love the Lord and the two daughters are married to Baptist pastors. Prior to coming to EMBC Bro. Tracy served 5 years as Senior pastor of Harvest Baptist Church, Clayton NM. In the past he has served as Christian School Principal at Valley Baptist Academy, Espanola, NM, and also as the Principal at Bible Baptist Christian Academy in Hines, OR. Bro. Mike Tracy attended Montana Wilderness Bible College where he studied Bible and Interpersonal Relationship Ministry. He loves serving the Lord and ministering to people of all ages. Both Mike and Karen are Arizona natives. Mike graduated from Phoenix Christian High School and his wife from Mountain View High School. 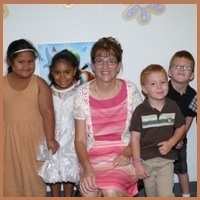 Mary has worked with children of all ages since she became a Christian in 1978. God has gifted her to relate in a positive way to the many challenges of communicating the Gospel through Bible lessons. Many children have come to know the Lord as their Saviour. She has had the privilege to train many young people and new Christians to become teachers. She has worked as a registered nurse for many years in different venues of the healthcare profession. East Mesa Baptist Church is blessed with a medical ministry which provides medical equipment and supplies. Mary has helped many in the congregation and community by not only being a consultant, but also by being a fervent prayer warrior. She is a model pastor's wife. Pastor Hughes married way over his head. John and April McDaniel came to East Mesa Baptist Church in April of 2011 and served as Ministry Interns. At a revival meeting preached by Evangelist Mark Rogers in 2012, John and April surrendered to go to the mission field on the Navajo Indian Reservation. 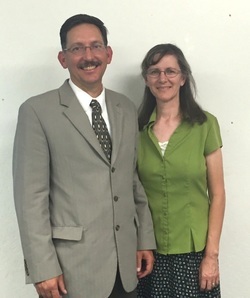 In June of 2014, they were approved as BIMI Missionaries, and on October 26, 2014, John was licensed to preach and the congregation at East Mesa Baptist Church voted to be the McDaniel’s sending church. The McDaniel family started deputation in March 2015. For more information please view and read this BROCHURE! Melissa is from Thorp, Wisconsin, where she attended Missionary Baptist Church in Greenwood, WI, formerly pastored by Rob Love. Melissa graduated from West Coast Baptist College, Lancaster CA, with a missions major and TESOL certificate. She spent a year in El Salvador as an English teacher at a Christian school. She serves as a ministry assistant in the office and in the music ministry as one of the church pianists. She also teaches in the children’s Sunday School, AWANA and VBS and wherever else she is needed. We are blessed to have her on staff at EMBC. ​Dr. Paige is responsible for ministry to the Keenagers (age 55+), general visitation, leading the choir, and helping with the song leading and special music. He also fills the pulpit often and shares teaching responsibilities for the adult Sunday school class. He is enjoying the opportunity to be active in ministry in his retirement years.